Last weekend the weather held out and I joined over 20 adults and children gathered at Columbus Parkette to paint the pool, enjoy a community BBQ and have some fun! I am happy to say that since my first park walkabout with residents I have been working very hard to make necessary improvements to this great park space. As some of you are aware I am committed to working with residents and stakeholder groups to improve accessibility and strengthen neighbourhood connections to park spaces all across ward 14 (look for a future posting on a BRAND NEW PARK in the ward!!). The Columbus Parkette Beautification Project, led by a strong community, is committed to working with my office to transform this park space to create a sense of ownership and community-building for the neighbourhood at large. I am pleased to be a part of their first accomplishments and look forward to participating in their future successes. I would just like to follow up from my posting last week regarding park improvements. I will be hosting a public meeting on October 9th, 2008, 6:30pm, at Parkdale PS (staffroom) to share the project design with you and get your feedback on the design work done to date. I would like to invite all of you living around this green space to share your experiences of accessing West Lodge Park, and to identify additional opportunities for improvement in this great space. The Queen West Art Crawl, developed by Artscape in 2002, is a one day festival geared towards showcasing local art. This exciting event has gained great momentum over the last five years and has grown into a unique 3 day event that attracts over 100,000 participants annually. This year, Artscape partnered with the Parkdale Liberty Economic Development Corporation (PLEDC), a community organization with experience working with artists in the Parkdale neighbourhood, to bring to Torontonians a fresh and dynamic QWAC. I had the pleasure of joining PLEDC, Parkdale residents and local artists to launch this event at the Gladstone Hotel. Congratulations to all participants, Artscape and PLEDC for bringing this unique art event to Parkdale and for working so hard to make this year’s QWAC such a great success! In an effort to provide as many electors as possible with important information about federal elections, Elections Canada has produced, in 27 heritage languages, a voter information guide and a document concerning voter identification at the polls. All documents are in PDF format. All of us want to keep our air clean, but that’s something for big business and government to do. The average person can’t do anything, right? Wrong! Here’s a simple thing that all of us can do to help improve the quality of the air we breathe. Instead of idling vehicles, turn off the engine when you are not in traffic. It’s a simple but effective step toward cleaner air. The City of Toronto is having an idle free blitz, running from Sept. 29 to October 3, to educate residents on the importance of not idling vehicles. When a vehicle is being idled, harmful contaminants are released into the air when you idle your vehicle. Recent studies have shown that contaminants from vehicle emissions are major contributors to deteriorating air quality in our city. By turning off your vehicle’s engine, you can do your part to help keep our air clean. Reducing vehicle idling can help improve the air we breathe. The Air Quality Health Index is a new tool that measures air quality in terms of our health. Hourly readings and forecasts are available at www.airhealth.ca. And, not only does reducing idling save our air, it can save money, too. Ten seconds of idling uses more fuel than re-starting your engine. If your vehicle is left idling for 10 minutes a day, you would use up more than 100 litres of fuel in a year. Improving air quality and saving money – that’s a combination you just can’t beat! Here are a couple of other tips that can help. It’s better to warm up your car by driving it rather than idling the engine. Warm up times are reduced by half and you’ll use less fuel. Use remote car starters sparingly. The use of this item results in additional engine idling. The City of Toronto has a by-law aimed at reducing unnecessary idling. It limits idling to no more than three minutes in a 60-minute period. As well, the by-law allows for idling during extreme outdoor temperatures to ensure heating or cooling inside a vehicle. It’s time for all of us to take a lead role in clearing the air. Turn off your vehicle’s engine instead of idling. Let’s all breathe easier. 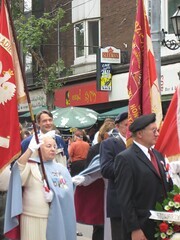 For the second year in a row I had the pleasure of participating in the procession at the Roncesvalles Polish Festival. This year I believe the Polish Festival was more exciting than ever! It was attended by thousands of residents from Toronto and abroad, many of you who I walked with last year and was delighted to see again. I want to extend a huge thank you to the Roncesvalles Village BIA and local residents for their commitment to making this a fantastic event. The Polish Festival is a great example of what can happen when dedicated community members bring their knowledge, experience and resources together to celebrate the larger community. Looking forward to doing again next September! I believe there has been a lot of misinformation circulating in the community regarding the permitted use of building at 2154 Dundas St. W. Since I was first notified by residents of their concerns regarding parking and occupancy I have been working very closely with staff in Building, Municipal Licensing and Standards and City Planning to ensure that the developers create clear communication tools to confirm the commercial use of this property. This building was originally constructed in 1919 as a 5-storey light manufacturing building. It appeared to be used as such up to 1981 when permits were issued for uses described as light manufacturing and “artist and photographers studio”. It’s important to note here that the “artists and photographers studio” is still an industrial-type use within the zoning bylaw and it does not allow spaces to be used as residences, including “live/work” or apartments. Currently the Property is zoned MCR. Under this zoning the City allows a wide range of commercial and residential uses, however, the building is currently classified as a commercial building which means that the loft must be used exclusively for commercial purposes. Should a property owner want to use their loft for residential purposes, they must apply and obtain a building permit from the City of Toronto for the proposed change of use prior to commencing such residential use. Applying for such a permit would involve payment of application fees, the obtaining of planning approval(s), an application for a building permit for a change of use and the payment of a number of levies and charges. I have provided this information to you because while a conversion from commercial to residential may be permitted, any alteration could result in planning approvals necessary for parking and loading among other things. I will stress that an approval of this kind can be a lengthy, costly undertaking, and may require site plan approvals and a traffic study (residential use would require provision of parking). As many of you have stated, the neighbourhood is strained for parking as is. Finally, I have confirmed with staff in the City’s Transportation/permit parking department that this is a commercial building and that no permits are to be issued to this address. Transportation’s computer system will be updated to ensure parking permits are not issued to anyone at 2154 Dundas St W.
I am pleased to announce that through my work on the budget committee, West Lodge Park has been secured for wading pool rehabilitation in the 2008 Parks capital budget. Much of the improvements will be made to the water chamber, but I have also requested that a number of landscaping features also be incorporated in this project. After meeting with staff and speaking with some of you in the community, a seating wall, new walkways and softscaping have been added to the design. Please be advised that I will be hosting a public meeting in late October to share the project design with you and get your feedback on the design work done to date. I would like to invite all of you living around this green space to share your experiences of accessing West Lodge Park, and to identify additional opportunities for improvement in this great space. I will post more details on my website as they become available. Stay tuned! Come and celebrate the new rainwater harvesting system with Greenest City! Food! Sample free food from our delectable Local Food CafÃ©… and enjoy an afternoon corn roast and local apples. Local Food CafÃ© opens from 12:00-1:30. Music! Featuring accomplished performer Chris McKhool, who at 1pm will delight with his children’s music for the green-at-heart; also featuring African drummers, Tibetan folk music, storytelling and harpist, and more. Eco-activities! Arts and crafts, free bike check-ups and garden scavenger adventures. Fall Fun Fair! 3-legged races, bobbing for apples, hay-bale toss and more! With prizes for the fastest, strongest & silliest! For more information contact: Gelek 416-922-7626. 1) Food preparation [9:30 am – 11:30 am]: 2 hours of chopping help. 2) Set-up team [9 am – 12 noon]: this team is important. 3) Dish Washing Station [11:45 – 2:00 pm]: help keep the dishwashing station stocked and moving well. 4) Corn Roast [1:30 – 4 pm]: be a fire keeper, husker and all-around corn-y king. 5) Food Servers [11:45 am – 1:30 pm]: have the pleasure of serving local organic food to guests. 6) Clean-up [4:30pm – 6:30pm]: the all-star “many hands make light work”team. 7) Runners [12- 2pm and 2-4pm]: fetch things that we need during the day. Volunteer letters and hours will be provided. Just email us and say what team you would like to be a part of, and thank you! As you know Councillor Giambrone and I have hosted a number of public meetings and design committee meetings over the past two years for the Dufferin Jog Elimination Project. Many ideas were presented by residents/ business owners and/or stakeholders from Ward 14 and Ward 18, and I am pleased to say that City staff have responded to the community’s needs wherever there is an opportunity to do so. I am also very excited to begin work on the public art component with stakeholder groups and the City’s Culture division. Stay tuned for more information. Please find attached a public notice advising residents of the construction of a rail underpass at the intersection of Queen Street and Dufferin Street. This notice will be distributed to residents and businesses in the area of the project by the end of next week. Should you have any questions about the project or would like to be part of my mailing list, please contact my office.